The book examines the changes in perception and visual arts with the emergence of new technologies. 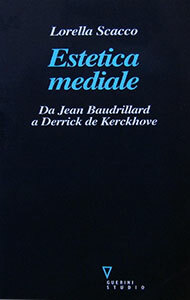 Starting point of the essay is the analysis of the thought of two best-known experts, Jean Baudrillard and Derrick de Kerckhove. After examining the many conflicting views of two scholars, the book explores the same issue from the position of artists. The text goes into evolution of the image since the seventies through new technologies, from video to the digital, and relates to the direct experience of contemporary artists working with technology. The volume is enriched by the direct testimony of the artists Fabrizio Plessi, Studio Azzurro, Alba D’Urbano, Botto & Bruno, through the interviews conducted especially for the occasion. The final confrontation between the two scholars’ opinions and experiences of contemporary artists brings to light new and interesting information about what is happening in the field of aesthetic media.